In a tropical country like India, anti-infectives continue to hold significant share in IPM (Indian Pharma Market). 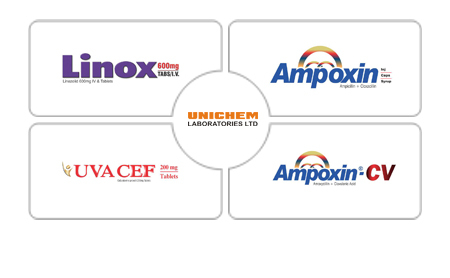 We at Unichem have been aggressively working to increase our share in the growing anti-infective market by repositioning and focussing our legacy brands such as Ampoxin (Ampicillin) and its combinations. Ampoxin has established itself as a first line in management of SSTI’s (Skin and Soft Tissue Infections) and RTI (Respiratory Tract Infections). Ampoxin is widely used as a drug of choice by doctors in rural India. Additionally, Unichem has introduced many new antibiotics to plug the portfolio gap and be a serious player in the field of anti-infectives.